Please refer to our stock # CP27 when inquiring. An attractive antique Chinese porcelain plate, hand painted with a large, leaping blue carp with russet colored cross-hatched scales. The carp was an auspicious fish in China and a symbol of perseverance and success, often applied to success in business enterprises and state examinations. In excellent condition (no cracks, chips or hairlines), this deep-dish plate would have served as a large shallow bowl as well. 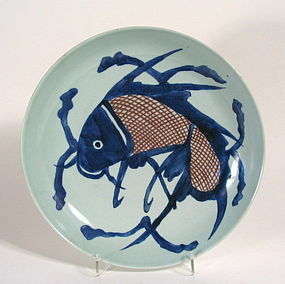 Dating from the Yongzheng to Qianlong Periods (AD 1723 - 1795), this plate is of a larger size than most similar fish plates. Please see the last photo for a size comparison with one of a pair of our already listed fish plates, stock number CP3&4. DIMENSIONS: 11.25" diameter (28.5 cm) x 2.25" high (5.7 cm).